Discussion in 'General Genealogical Queries' started by jorghes, Jan 7, 2019. My Christmas card from one of my maternal cousins who knows I research our mutual branch of the family tree included a conundrum. I wanted to see what the venerable brains of this forum thought about this before I offer what I think may be the explanation to my cousin. Our mutual ancestor William Williams was born in about 1832 in Newport, Monmouth, he possibly married Ann Jenkins around 1860 (I say possibly, as I have never managed to find a marriage for them both), she was born in approximately 1828 in Glamorgan (presumably Cardiff though unconfirmed). All the children are listed as being born in Newport. William Henry (1862), Frederick Augustus (1867) and Joseph (1870); they didn't have a daughter Charlotte, however they did have a daughter, Elizabeth Ann, born in 1862, which would match "Charlotte A". There is also possibly an older daughter, born about 1860/1861 called Mary Jane. and a grandson, another William Henry, aged 7. I have searched the GRO and can't find a matching set of "Turner" children for the ages given, although I have a set of Williams children with a Jenkins mother for William Henry, Elizabeth Ann, Frederick Augustus and Joseph (And a possible for Mary Jane). I have both William Henry & Elizabeth Ann's birth registers and have ordered those for Frederick and Joseph just to confirm. I believe that the 1871 census record is a very strange error, giving the children a "Turner" surname as opposed to "Williams", though I can't explain how it occurred. I have not found William or his wife Ann Jenkins on any earlier censuses than 1871, though I probably should be able to find them as a married couple in 1861. Ann died in 1895, and William appears on the 1901 census at 3 Robert St, with Benjamin Thomas & Mary Jane. I don't know where or when William died (difficult to find the right William Williams in Wales...), but I haven't discovered him, as yet, in 1911. Would I be right in suggesting to my cousin that the 1871 census is a rather strange anomaly? Or is there another explanation? I'd suggest focusing on the possible reasons why you haven't been able to find the marriage - you may find that the Turner surname is part of the solution. I was having a search for Mary Jane and her parents in the 1861 census, and I may have come across the reason that I can't find the marriage - I found an 1861 census return with a William, an Ann and a Mary Jane all of the correct ages, in Newport - but with John, 9; and James, 6. So I moved back in the marriage records (from 1860) and a reasonably wide sweep found a possible marriage in Newport for the first quarter of 1847 between William Williams and Ann Jenkins. I've added it to my current spurt of orders from the GRO, and in order to confirm a possible extra bunch of children, the Williams/Jenkins births for a John (1852) and a James (1855) from Newport which I discovered in the GRO records that match the 1861 census returns. **on a happier note, if the 1861 census return does come through, it may also have solved my brick wall of William's parents, as they're living on a farm called (?) Mendell Gief, with another William Williams, 54, his wife Jane, also 54, and their three unmarried daughters aged between 20 and 25. Ann would probably not have married for the first time in 1860, since she would have been 32 (based on the 1871 Census). That's why I suggested you considered the reasons why you couldn't find the marriage - one of which was that it wasn't her first marriage. If William and Ann did indeed marry in Q1 1847 then William's age (39) in the 1871 Census is almost certainly wrong - which seems fairly unlikely given that Ann was older. I only order marriage certificates as a last resort - so many marriage registers are online these days. Did you remember to check Monmouthshire marriages at Findmypast? There was a marriage in 1851 between a William Williams (haulier, father William, farmer) and an Ann Jenkin(s) (father John, labourer) at Malpas, a mile or two north of Newport. Both were shown as of "full age" which is often a clue that at least one of them wasn't. This marriage ties in more closely with William's stated age in 1871 and the birth of their first child (if it was their first child) in 1852. I didn't consider that Ann could have been married before - but then I couldn't find any matching records for Turners with the appropriate first names on the GRO (William Henry, Frederick or Joseph), either with or without matching maiden names for the mother (regardless of what it was). I did find matching Williams/Jenkins births for all three of the boys - and I do already have William Henry Williams birth entry from a previous search to do with the grandson that appeared in 1891. I can't find a single "Charlotte A Williams" or "Charlotte A Turner" in the GRO for Newport in approximately 1862. It is of course possible that this isn't my ancestor, but everything else matches when Elizabeth Ann Williams (birth register which I have) appears on the 1871 census. Thank you for finding that, I have now discovered it. I kept searching for this particular William Williams from the 1861 census, and discovered the 1851 census return where he's suggested to be 20 and unmarried, which would fit with the 1851 marriage in November. I had forgotten that there are parish records on FMP - I search through so many different parishes and counties that I can forget where I can access different things - I should start keeping a list. 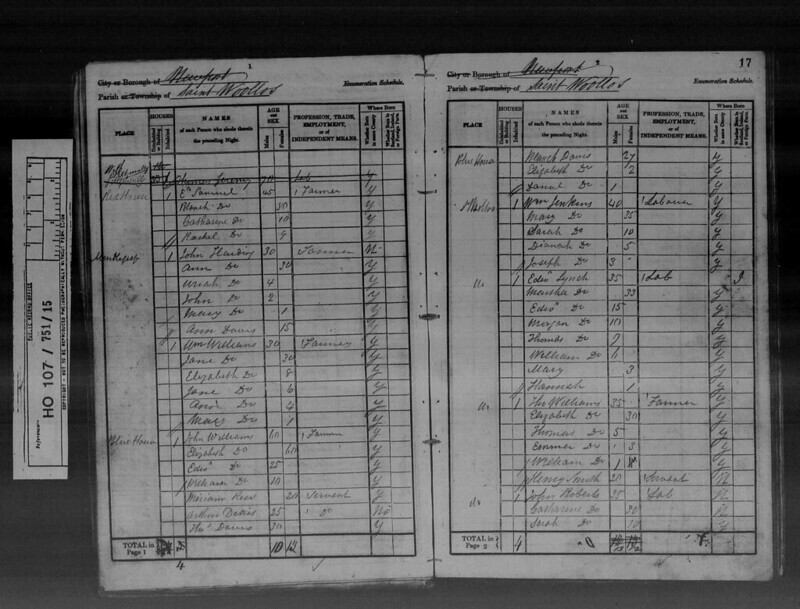 Unfortunately that marriage certificate doesn't give a Turner either (had a look at the witnesses), neither does looking for a Williams/Turner birth for any of the possible younger siblings of William from the 1861 census - Amy, Mary and John (discovered there is a stroke which might make "7" from the transcription into "17" - although "Thomas" still looks to be 3, and possibly is an illegitimate son of one of the sisters), unfortunately most of the records that might match are all similar: Jones, Jenkins, Morgan and for some there are more than one (there were about three Marys with a Morgan or Jones on the GRO for Newport in the same 2 year period!) Which unfortunately makes it slightly more impossible, that and the girls may have been using nicknames, as the 1851 (and possible 1841) census returns I have found seem to change the names - The 1861 census has Jane, Amy and Mary; the 1851 census has Jane, Emma & Mary with slightly different ages. The birth entries for James & John are due on the 11th, and those I discovered for Frederick and Joseph in a couple of days. The witnesses may not be family - one of them also witnessed the next marriage in the register, which was the following month. Turner may be an error by the enumerator caused my muddling up the schedules during the copying process (look at the schedule numbers on that page). You could try looking at the same location in other censuses to see if there were any Turners living there. The same witness appears three times on the two pages - along with another two "Pallingers", probably was a "go-to" witness for the vicar. I will have a look around at the pages and see if I can find any Turners. In the 1871 census, at number 22 Baldwin St (the next page), there is a William H Turner, aged 8, a visitor at a Turner household, where the enumerator had to change surnames a few times. I agree, it looks as if Turner was an error by a confused (or drunk?) enumerator. Thank you for your helpful suggestions Peter, I’m going to wait for the birth registers to come in before I offer this answer, and hopefully some new information on marriages, parents and new children we didn’t know existed to my cousin. Confirmation has arrived, both John (1852) and James (1855)’s birth registers match what I currently know about the family - William Williams, labourer of some description, Ann Jenkins, neither of whom could write. Thanks again for your aid, Peter! Does anyone know where I can find out what Peterstone may have been previously called, or alternatively it's Welsh translation? Or which parishes might be close to Peterstone/Peterstone Wentlloog? Does anyone know where I can find out what Peterstone may have been previously called, or alternatively it's Welsh translation? GENUKI is a great source of information about places - just type 'peterstone genuki' into Google. If you don't know of it already jorghes, you may find this Genuiki web page useful. Peterstone's welsh name appears to be Llanbedr Gwynllwg. As a further note on this research - when trawling hints on Ancestry, a different 1841 census entry popped up (as a hint for one of the sisters). I think this may be the correct entry - as it has a rather blurred/scrawled "Mendlegieff" written in the address column. The household has William, 30; Jane, 30; and their children: Elizabeth, 8; Jane 6; Ann 4 and Mary 1, which seems slightly more likely than the other 1841 census entry I found. Unfortunately, there is no William, but next door (in "Blue House") is another set of Williams - John aged 60, wife Elizabeth also 60, a son, Edward (? ), 25 and William aged 10. William is really too young to be a child of John and Elizabeth, but if John and Elizabeth are William of Mendlegieff farm's parents, then this could be my William, aged 10, with his grandparents. The entry is 1841, St Woollos, 751/15/16/1 (Folio given as "17" on Ancestry), as seen attached. What do we think? (I'm going to have a look at if John and Elizabeth are still in the Blue House in 1851). **Check down the first column on the left hand page.